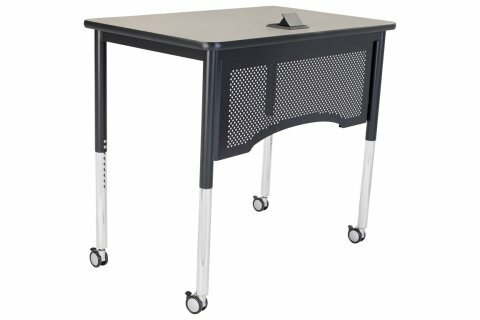 The Vantage Teacher's Desk is simple, solid and sensible, making it easy for an educator to go with the flow of class. 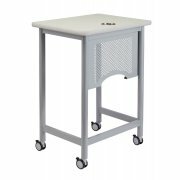 The neat and compact design allows you to move around the classroom to work with small groups, or lead a lesson from various vantage points. A perforated steel modesty panel creates a more private work space. This teacher's desk is built for the tough day-to-day use educators require. The smooth high-pressure laminate work surface is protected by a poly backer sheet and PVC edge banding. A unitized, tough-gauge steel frame provides sturdy support. 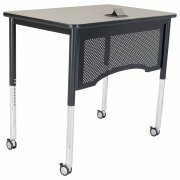 Optional casters and power port make this teacher desk even more convenient.